Skype is a word that is understood by grandmas and expat toddlers all over the world. Chances are it’s even more widespread than “to google”. 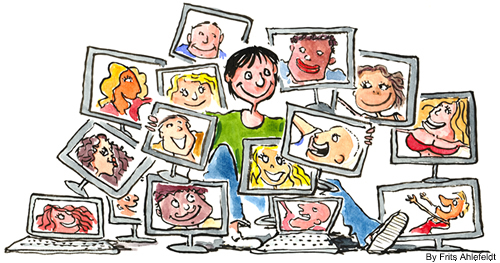 Not so well known is that besides calling family and friends or having cat conferences Skype can be a great business tool for anything from online collaboration and training sessions to reducing phone costs. It is (not only) for these professional users that the following tips will be interesting. Make sure Hotkeys in general, and the Mute function in particular are enabled. Description: When you get a lot of instant messages or simply use this function daily, these “plop” sounds can be very annoying, especially with headsets, especially if it is for some reason too loud and a tiny IM shoots directly through your skull. Benefit: One of the best tips to curb distraction and preserve sanity: disable IM sounds. Description: Whenever one of the people on your contact list goes online, Skype will tell you by popping up little window on your screen, even if you’re doing something completely different at the time, such as writing a blog post or trying to figure out where your money went that month. If you have a long contact list with a lot of users, you’ll see a lot of these notifications. Most of the time they aren’t relevant. Also, whenever someone experiences connection instabilities he will “flicker” and you’ll see these messages popping on and off. Benefit: Clear your headspace! Remove them! Benefits: Very cheap, good cost control and you have your phone book with you whenever you log in somewhere else. Skype will tell you to upload funds to your account. Yep, it’s not free, but still very affordable and convenient. I never use anything else anymore to make international phone calls. Benefit: Receive Skype calls even when away from computer and offline. Note: You have to pay for this feature. Standard rates apply. What tips do you use? Leave a comment below!